Today, Erin is so excited to tell everyone about her new, 12-page publication called, "Getting to Know the Insects." This publication is geared to youth and new agronomists that want to learn more about how to identify, sample and management field crop insects. It's available for $2 in the ISU Extension Store. Next, Matt and Erin talk about corn and soybean switching to reproductive stages around Iowa and implications for pest scouting and management. In particular, hot and dry weather favors twospotted spider mites, but expected cooler temperatures can promote soybean aphid populations. Erin also mentions a rare pest, redheaded flea beetle, showing up in a cornfield this summer. Read Erin's blog to see feeding injury on corn leaves. Erin also mentioned some upcoming field days at the ISU FEEL demo lab located between Boone and Ames, Iowa. The first is the Crop Management Clinic (13-14 July), which features a number of different topics related to crop production and protection. The second is an all-day workshop on corn insects (29 July). We aren't sure why, but there are a lot of references to MMA fighters in this episode?? 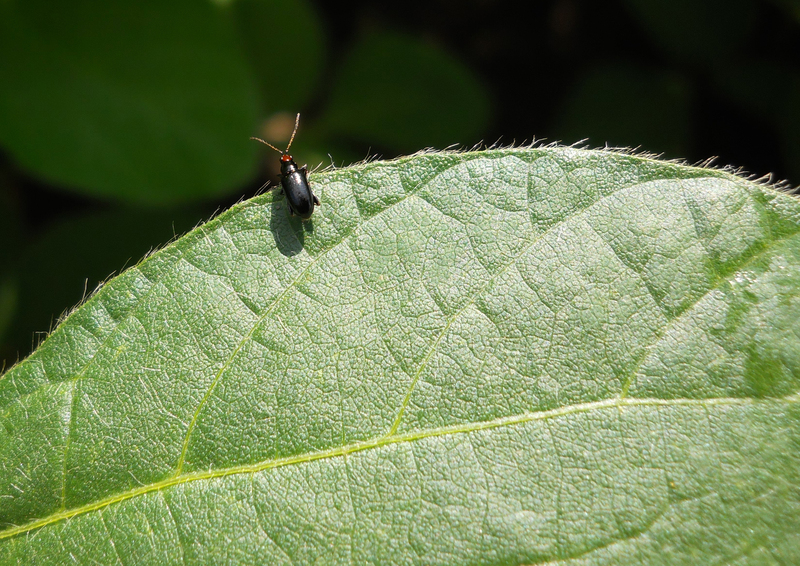 Redheaded flea beetle on soybean. Photo by Lewis Veith.